O! Jolly! Crafting Fashion: Machine Knitter, Why Cut and Sew? Machine Knitter, Why Cut and Sew? REGISTRATION FOR THIS EVENT HAS ENDED. This post is for the knitter who’d never consider cutting sweater fabric. 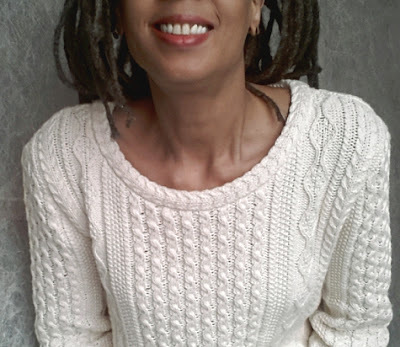 On April 21st I’ll be presenting “An Introduction to Cut and Sew Sweaters for Machine Knitters” to the Northeast Machine Knitters’ Guild, just outside New Haven, Connecticut (Location has changed from the previously announced site.) I’ll be demonstrating the cut and sew method specifically for the hand machine knitter. Guests are welcome. If you’re interested, please get in touch with the NMKG here. That’s what I said over 30 years ago in response to my friend and former draping teacher Imogene, when I was invited to see what her brand new serger could do. I had a couple years of machine knitting experience at the time and already quite a few full fashion sweaters (a sweater shaped on a knitting machine rather than cut to shape) to my credit. My dedication and, I believe, my sewing background allowed me to transfer my knowledge of shape and fit to the new-to-me knitting concepts of increases, decreases, and short rows. And I had no plans to ever cut my precious knitting. However, here I sit decades later, gleefully sharing how I take scissors to sweater knits as often as I can and sew the pieces into a garment. I find it an amazingly, satisfying experience. How things change! Make no mistake, I believe that nothing can replace the beauty and exquisite details of a sweater that has been well made and fully fashioned to the perfect fit. The very act of creating a full fashion sweater makes a strong statement. It takes time, and it’s efficient. This type of sweater can be produced without wasting any materials. While simple, the use of a full fashion decrease imparts both texture and shape simultaneously. Eventually I learned “well made” is not the exclusive domain of the fully fashioned. It's quite possible to have a very well made cut and sew sweater. We’ve all been exposed to cheap, poorly constructed sweaters... you know the ones I’m talking about. Making your own results in something very different. For example, we aren’t compelled to use serged (overlocked) edges on the inside, though it’s a good, quick finish for those who want one. For the machine knitter who already has a bit of sewing experience, the principles of a clean finish are quickly grasped. If you struggle with fit, cut and sew gives you a couple chances to get the fit just right -- without unknitting multiple times! For the machine knitter who also enjoys a little quality time with a sewing machine, you’re able to work with your already knitted panels of fabric to easily construct a sweater that is both well crafted and unique. Cut and sew is a method worthy of being added to your arsenal of sweater making techniques. And it’s fun! The act of taking something apart and putting it back together in a new way is enjoyable (I imagine this is how quilters feel). The method can be used to fully construct a sweater or applied sparingly in just certain difficult areas. (Necklines and pockets come to mind.) 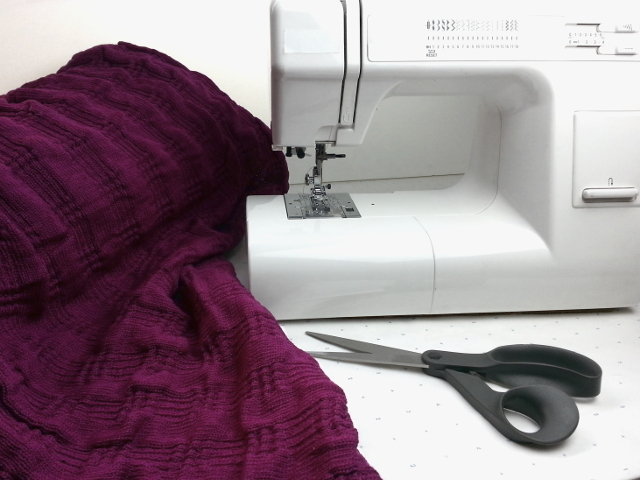 You don’t even need a serger! But be warned, your sweater making activities may increase once you discover how satisfying the results are. How to make your sweaters look as neat on the inside as they do on the outside. Curious? I hope you’ll come by. I'm interested in the online course. I was a machine knitter years ago long before I took up sewing. I hoped (and still hope) to create a jacket/cardigan using fabric I had knitted myself. I have a Toyota which does Jacquard knitting or at least will I hope when I get back to the poor neglected creature! Anne, thanks for the interest! 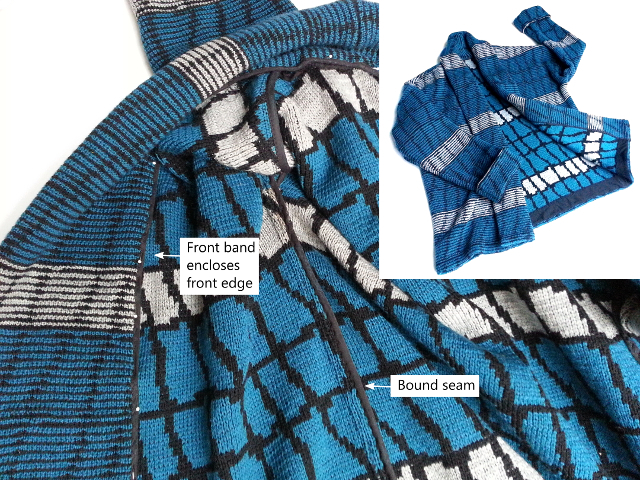 The online course presents techniques to confidently cut and sew sweater knits, fabrics you've knitted yourself or purchased. In the course we create a pullover sweater, but I use the same techniques when cutting and sewing a cardigan. It just takes a few more steps, as you already know! :) Be sure to sign up for further info (if you haven't already). All the best with your machine knitting. Jacquards are wonderful fabrics to cut and sew.